Star Chickweed (Stellaria pubera): Grows in woods and Rocky areas. Blooms March to June. 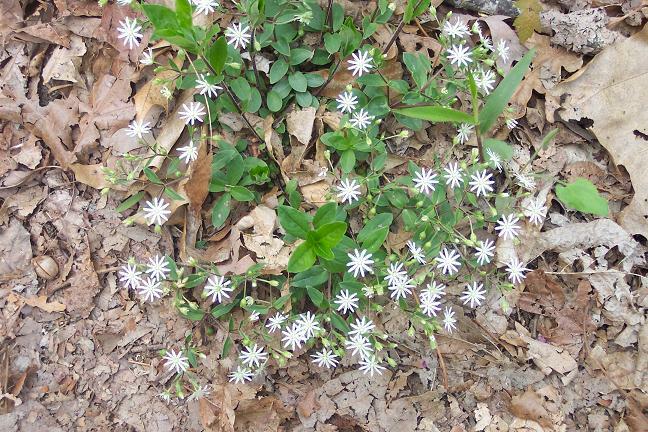 Location: Massanutten Tr, GWNF, VA.
Common Chickweed (Stelleria media): Grows everywhere in the spring. Location: On the AT in SNP. Lesser Stitchwort (Stellaria graminea): An alien chickweed. Lancelet leaves. The leaves in the background are from Indian Cucumber. Location: Canaan Mt, MNF, WV. Photo by Roger Eastman. 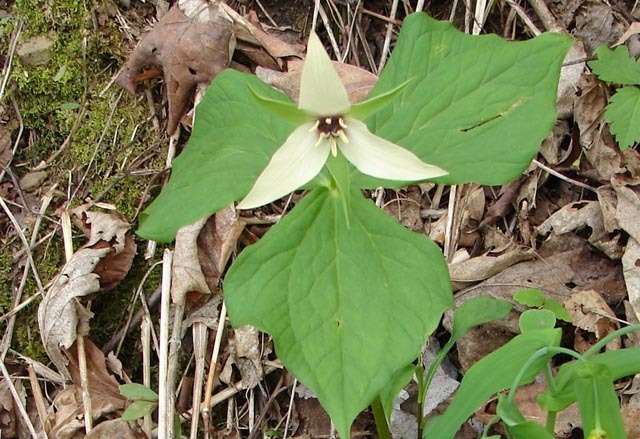 Painted Trillium (Trillium undulatum): Grows in moist forests and swamps. Blooms in May - June. 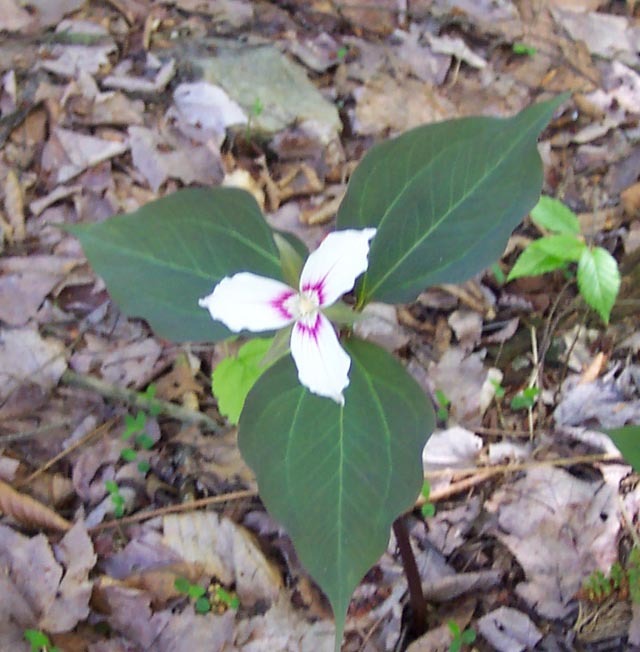 Don't confuse this one with the white variant of the Red Trillium below. Location: Mountainside Tr, Canaan Mt, MNF, WV. 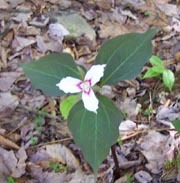 White Variant of Red Trillium (Trillium erectum): The first Trillium to bloom (April - May). 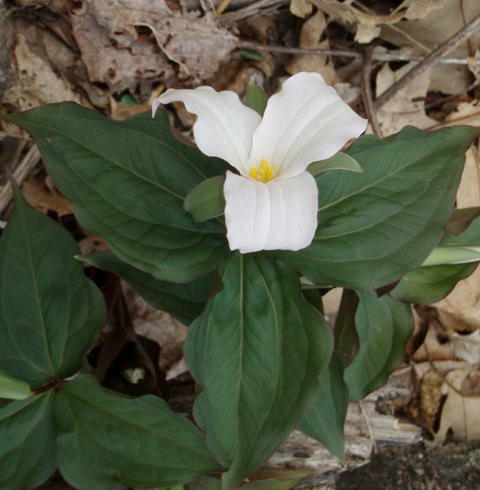 Do not confuse with the Painted Trillium (above) or the White Grandiflorum Trillium (Below). Photo by Patrick Roberts. Location: Allegheny Trail, WV. 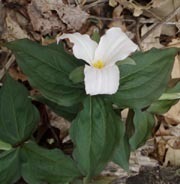 Large Flowered or White Trillium (Trillium grandiflorum): Prefers Shade. Blooms April-May. Produces a single red fruit. 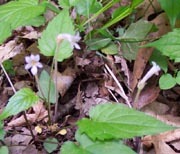 Location: AT, Thunder Ridge Wilderness, GWNF, VA.
Rue Anemone (Anemonella thalictroides): 5-10 petal-like sepals. 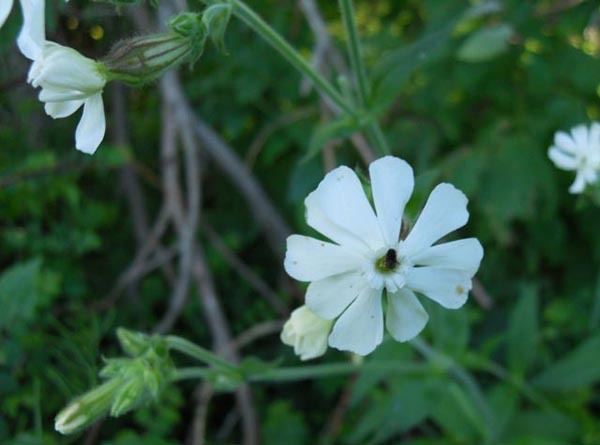 3-lobed, whorled leaves just below flowers, Blooms April/May. Location: Gunpowder Falls SP. Photo by Ken Clark. Wood Anemone (Anemone quinquefolia ): Early spring flower. 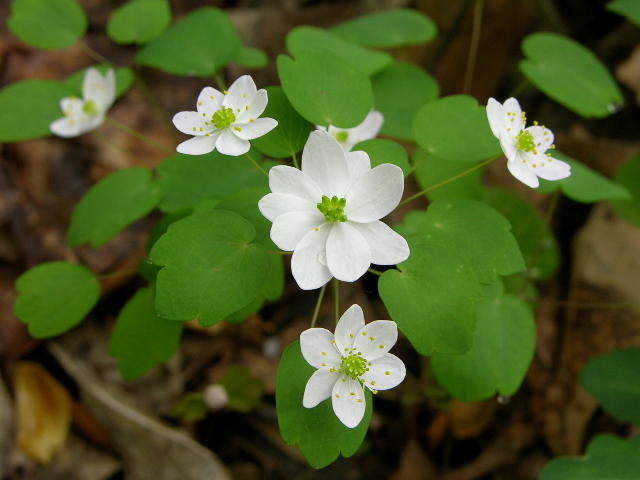 Flowers similar to its cousin, Rue Anemone but the leaves are lancelet shaped while Rue's are rounder and irregular. 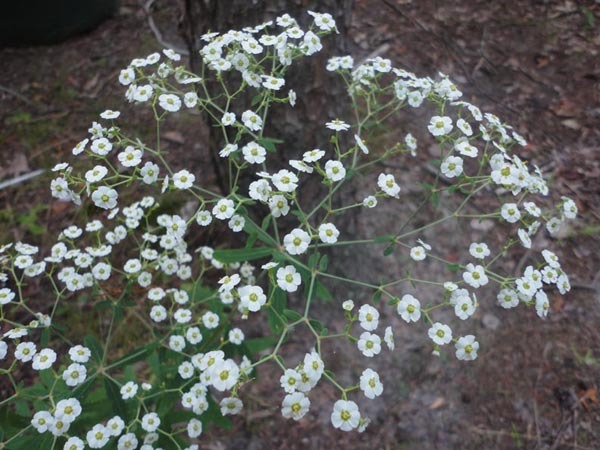 Grows in open woods, around rocks and as a border. Location: Great North Mt. Trail, near its junction with Laurel Run Trail. Thimbleweed (Anemone virginiana)) Single 5-petaled flower on a single long stalk. Leaves heavily veined and multi-lobed. Fruit reminiscent of a thimble. Photo by Dimitri Tundra. Tall Meadow Rue (Thalictrum pubescens) A tall (3-4 ft) plant found in wet meadows and swamps. Blooms in June-August. Location: Gunpowder loop Trail, MD. ): 24-30 inch erect plant. 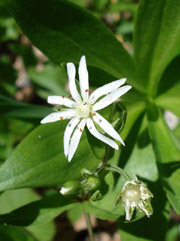 Flower has 4 highly fringed petals, giving the appearance of many petals. Note the 4 whorled lanceolete leaf pattern. Location: Piney Ridge Trail, SNP, VA. Photo by Ken Clark. 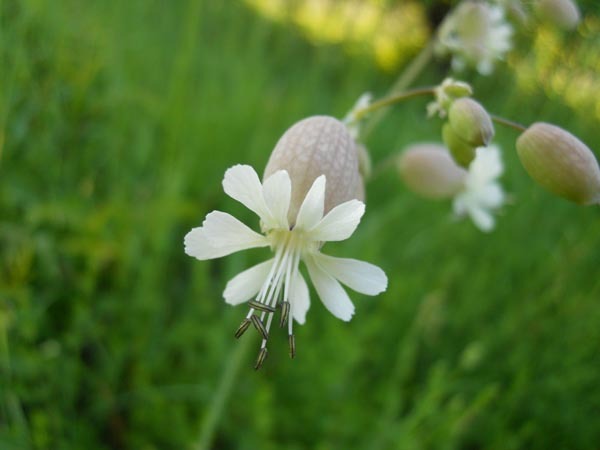 Bladder Campion (Silene cucubalus): An alien. The large sac is reminiscent of a striped watermelon. Photo by David Bennick. 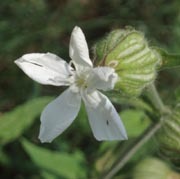 White Campion or Evening Lychnis (Lychnis alba): A European introduction having male and female flowers. Blooms all summer along edges, roads, fields and waste places. Location: AT, Reed's Gap, Blue Ridge Parkway, VA.
Forking Catchfly (Silene dichotoma) Similar to Bladder Camion (above) but has a much thinner calyx sack. Note the red/brown ribs on same. Photo by Dave Bennick. Multiflora Rose (Rosa multiflora) An garden escapee. Very fragrant. Bunch Berries (Cornus canadensis): Grows in the shade of heath, azaleas, etc. 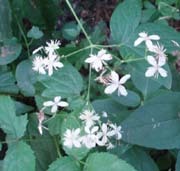 Short, compact plant with white flowers and green leaves give way to red berries and bright crimson foliage in the fall. Location: Roaring Plains, eastern portion of the South Prong Trail, MNF, WV. 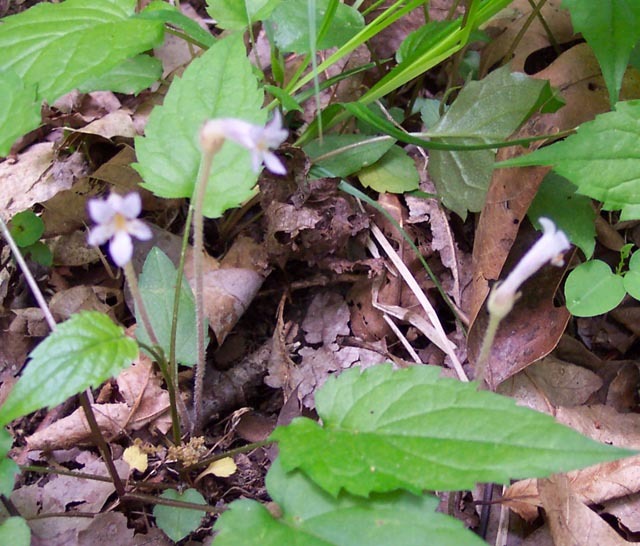 Round Leaf Hepatica/ White variant (Hepatica americana): Comes in blue, pink and violet. 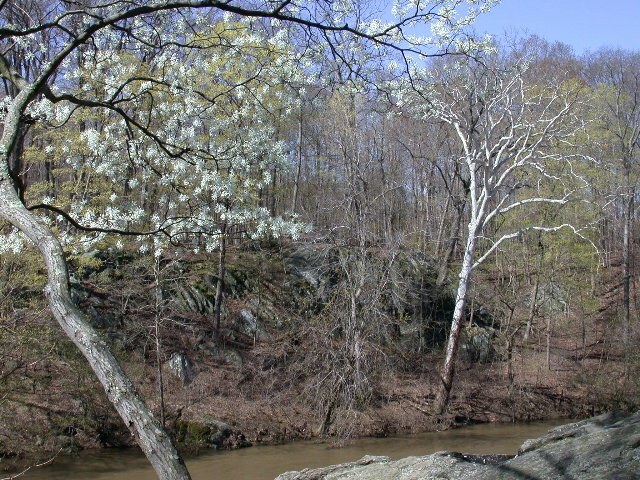 Early bloomer (March April) along streams and creeks. 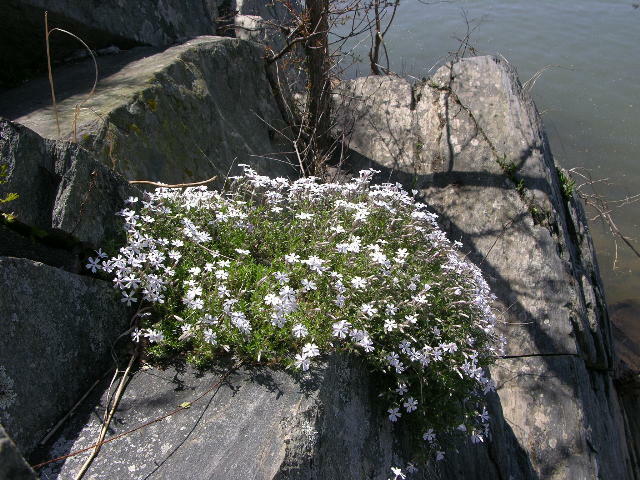 Location: Piney Run Trail, SNP, VA.
Moss Phlox (Phlox subulata): Very similar to garden phlox. found in different colors. Location: Great Falls NP, MD. Photo by Ken Clark. Partridgeberry (Mitchella repens): Pairs of simple white flowers at ends of creeping vines with paired, hevily veined, roundish leaves. Bears red fruit. Photo by Anita Mueller. One-Flower Cancer Root (Orobanche uniflora). A parasitic plant. Blooms April through June. Likes damp areas. 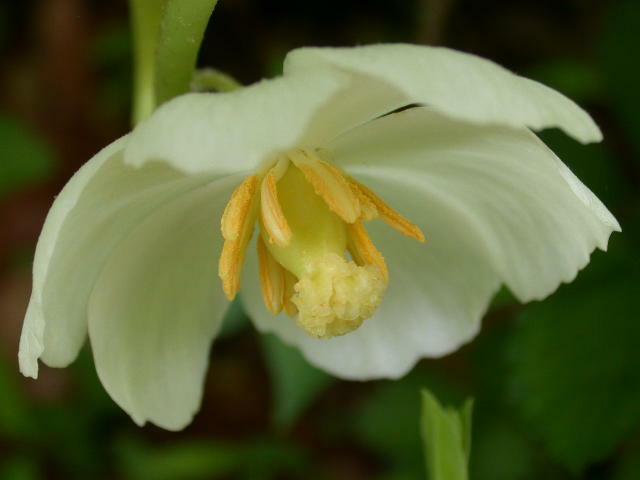 Location: Jeremy's Run Tr, SNP, VA.
Mayapple (Podophyllum peltatum): One large, nodding white flower usually hiding under two multi-lobed thick leaves. Gives rise to crab apple size fruit which is a favorite of deer. Photo by Ken Clark. 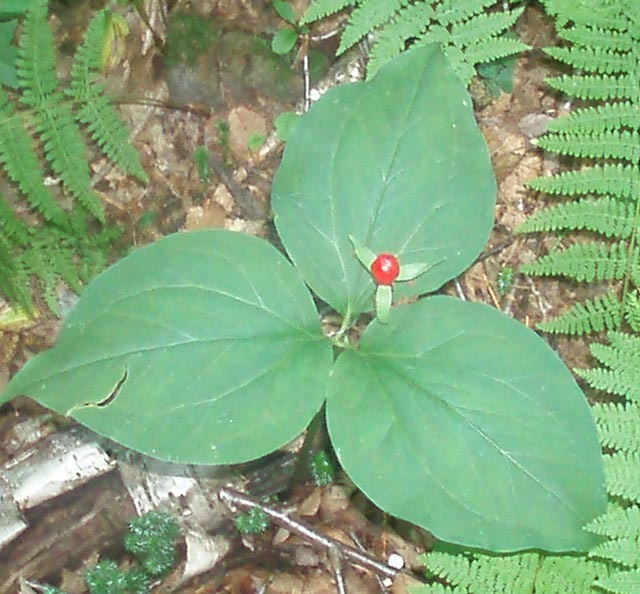 American Ipecac (Gillenia stipulata): Similar to Bowman's-Root except the lower leaf lobes of this species is sub-divided, giving the appearance of 5 leaves. A medicinal Herb. Location: Trayfoot Mt Tr, SNP, VA. 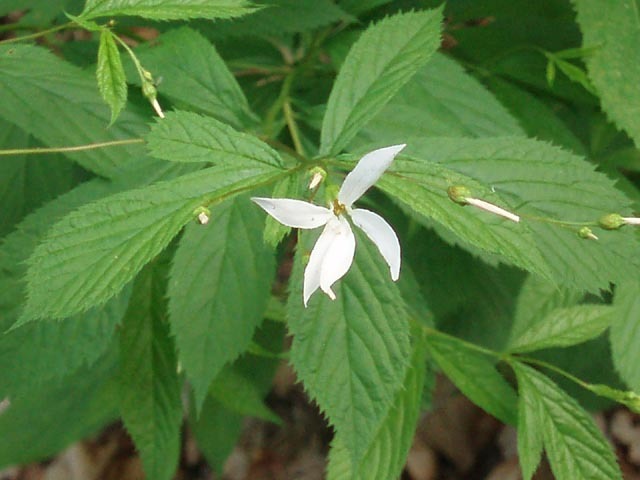 Bowman's-Root (Gillenia trifoliata): Similar to the above but without the subdivided lower leaf lobes. Photo by Dimitro Tundra. White Avens (Geum canadense): Upright plant, 1 to 2 feet. 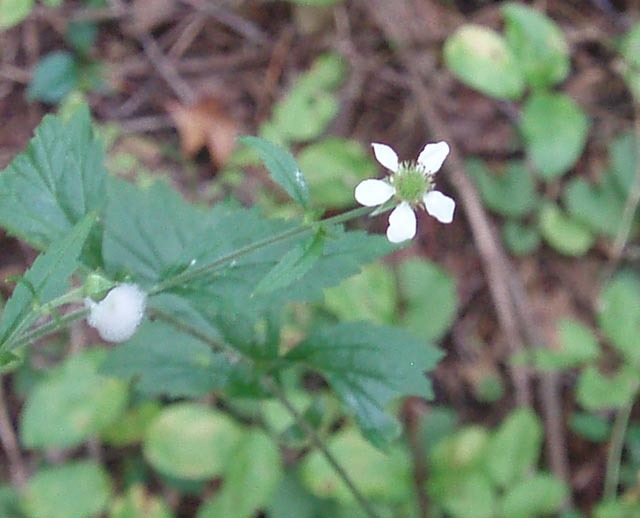 Simple 5 petal flower similar to black berries. Upper leaves single, irregular shaped. Lower leaves trifoliate to seven pronged. Small seed pods are very sticky hitch-hikers. Blooms June-August. Location: Blue Ridge Center for Environmental Stewardship. 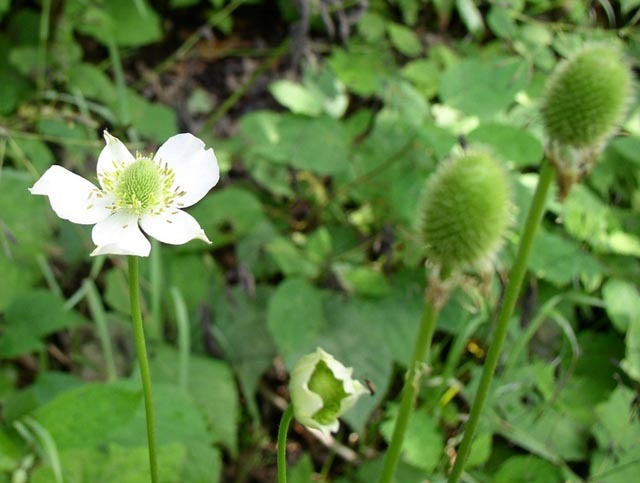 Rough Avens (Geum virginianum): Similar to White Avens (above) but lower leaves are larger and ovate - not multi-lobed. Long-leaved Houstonia or Bluet (Houstonia longifolia): White to light lavender with dark lavender centers. Paired leaves. 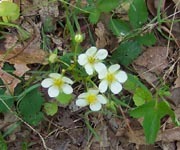 Small, tubed flowers in terminal clusters of 2s or 3s. Late spring/early summer bloomer. Prefers dry soil. 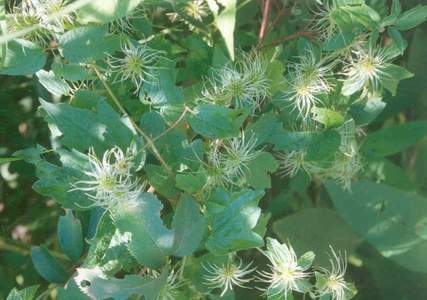 Location: RBrown Mountain Trail, SNP, VA.
Virgin's Bower (Clematis virginiana): A vine that blooms fron July to September. The silky strands shown here are actually extensions of the seed pods. 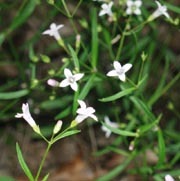 Clusters of small white flowers give way to these in the fall. 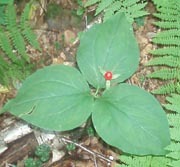 (See lower phot taken at GWNF, VA in the Tree Ridges Wilderness area, VA) Grows on woods edges and along waterway banks. 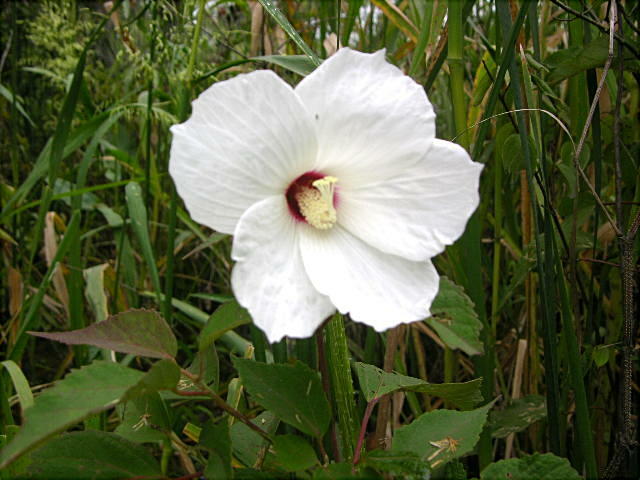 This specimen was found along an old road/trail in Great Falls National Park, VA.
Crimson-eyed Rose Mallow (Hibiscus palustris forma peckii): Blooms July to September in marshes. Can grow to 7 feet tall. Location: Jug Bay, Patuxent River, MD. Photo by Ken Clark. 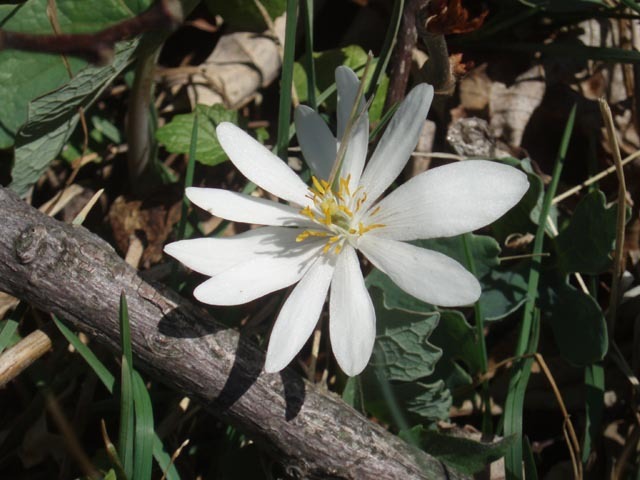 Bloodroot (Sanguinaria canadensis) : An early riser in spring. Grows out from under dead leaves on the Forest floor. 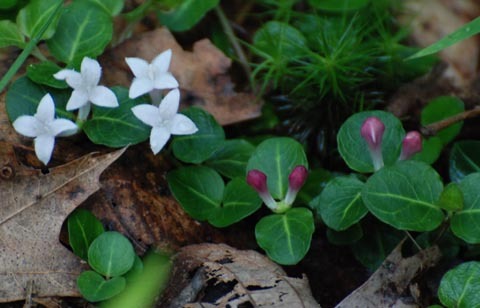 Location: AT near Reeds Gap, VA.
Cut-leaved Toothwort (Denteria lanciniata): White or pink flowers. Bloom April-May. Prefer wet areas. Location: Along Pond Run Trail, Green Ridge State Forest, MD. 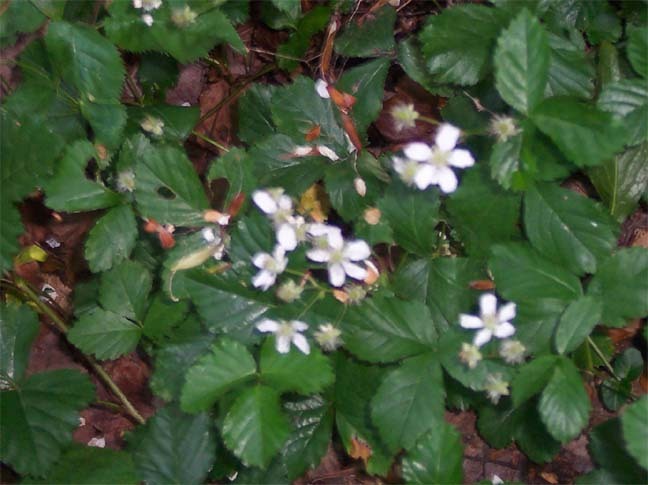 Common Strawberry (Fragraria virginiana): A creeper. Blooms in spring. Produces small red fruit. 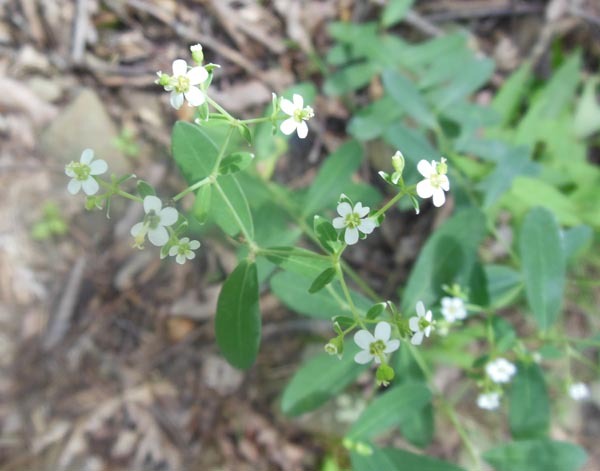 Location: Knob Mt Tr, SNP, VA.
Flowering Spurge (Euphorbia corollata): Found in dry open woods and fields. Stems contain a milky juice which has been used as a laxative. An overdose can be poisonous! Location: Downs Park, MD. Grove Sandwort (Arenaria lateriflora) Similar in appearnce to Flowering Spurge (above) but with fewer flowers. Prefers wet spots. Photo bt Dave Bennick. 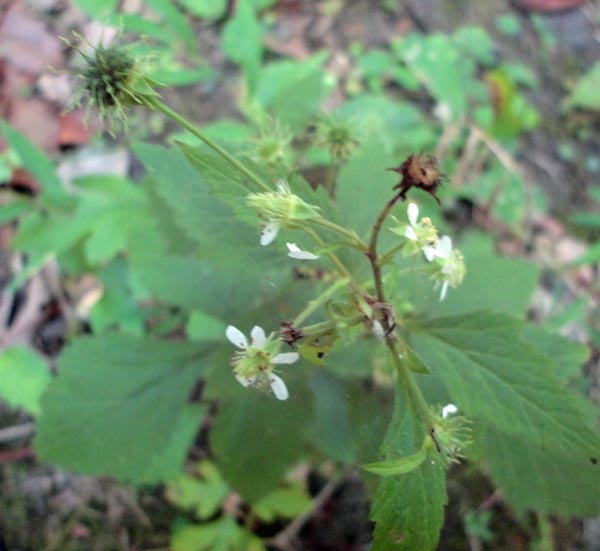 Dewberry (Rubus hispidus): Forms mats in damp areas. Produces small blackberry-type fruit. Location: Moore Run Tr, Otter Creek Wilderness, MNF, WV. Large Toothwort (Dentaria maxima) - Blooms April to May. Plants have much wider leaves than its cousin, Cut-leaved Toothwort. Photo by Patrick Roberts. Location: Allegheny Trail, WV. 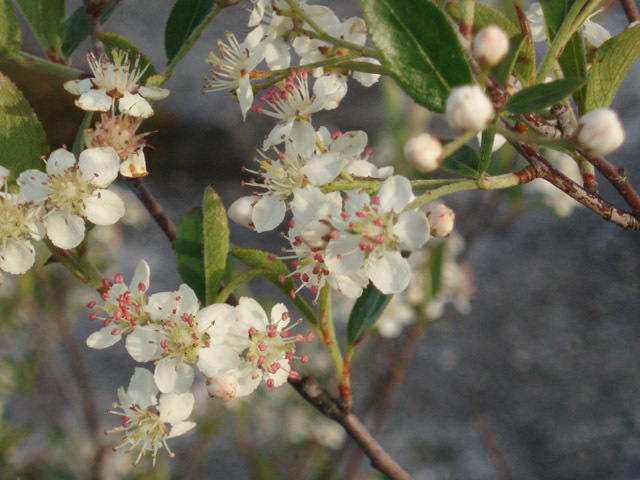 Service Berry (Amelanchier canadensis): AKA Shad Bush. Grows to 20 feet. First tree to bloom in spring. Bears bright red berries in fall. Photo by Ken Clark. Red Chokeberry (Aronia arbutifolia): One of 3 varieties. In the heath family. Fruit is bitter, hence the name. Location: Table Rock, Canaan Mt, MNF, WV. Lowbush Blue Berries (Vacciniium angustifolium) : White to very pale blue blossoms. 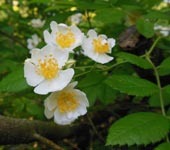 Grow in dense thickets in woods or open fields. Fruit ripens in July at lower elevations. Location: Massanutten Mt., GWNF, VA.